Norfair as it appears in Smash. Norfair (ノルフェア, Norfair) is a stage in Super Smash Bros. Brawl, Super Smash Bros. for Wii U, and Super Smash Bros. Ultimate. It was confirmed by Masahiro Sakurai on the Smash Bros. DOJO!! on November 9, 2007. However, it was selectable for play in the Brawl demo available during many events in Q4 2007, being the only stage not announced for the demo. Ridley is fought here when being unlocked in Ultimate. The giant wave of the magma coming in to the stage. The safe zone (shown in the upper right corner) is the primary way to avoid getting damaged. 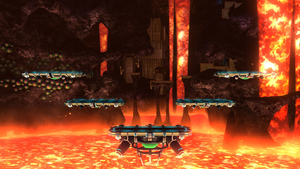 Norfair has five small platforms in the air, arranged in a V formation, with a volatile sea of magma at the bottom of the stage. The pass-through platforms are ideal for characters with far-reaching ground attacks or for characters with a good air game/up special. 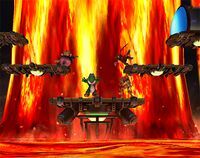 As the player fights on Norfair, magma will rise every so often and cover the platforms, similar to the acid in Planet Zebes in Super Smash Bros. and Brinstar in Super Smash Bros. Melee. It can rise to three different levels and causes strong fire damage, but prevents KOs via the lower blast line. Magma sometimes falls from the sides too - this hazard covers over half of the stage. A wave of magma will also appear from time to time, slowly approaching the stage from the background. When this wave forms, a safe area will pop up on a random platform, with the design based on the bubble doors from the Metroid universe. It is unnecessary to fight for this safe haven as all magma hazards can be dodged, air dodged, shielded, and perfect shielded with decent timing; players can also take advantage of invincibility frames from edge-grabbing the numerous platforms. The safe haven can also be a hindrance since characters can still be hit through the refuge by those on the outside. It is also possible with characters with many short jumps such as King Dedede, Kirby, Meta Knight, Pit and Jigglypuff to completely avoid the wave by jumping over it. If items are turned on, an item will always spawn in the safe zone after appearing. Sometimes, the safe zone won't open until after the magma wave hits. The final stage hazard of Norfair are the occasional showers of magma that spurt in an arc and land on the middle platforms, which are better avoided than shielded given the difficulty in determining where they will hit. In Ultimate, magma hazards can no longer be shielded or perfect shielded, though players can still dodge or air dodge them. In Super Smash Bros. for Wii U, the Ω form is the lower platform stretched out. Magma will not engulf the stage. In Super Smash Bros Ultimate, the main platform of the Ω form and Battlefield form is slightly redesigned from SSB4 and is also resized and reshaped to match Final Destination and Battlefield, respectively. The three soft platforms of the Battlefield form resemble the ones in the normal form. 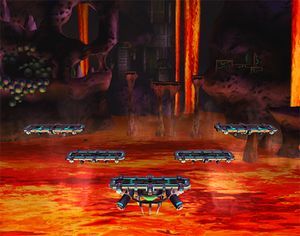 Although Norfair first appeared in Metroid, aesthetically this stage is based on how the area appears in Super Metroid and Metroid: Zero Mission. Located deep below the surface of Zebes, Norfair is one of the most dangerous areas Samus ventures through; it includes caverns and tunnels full of magma, and intense heat that damages Samus by just being in the area. It is not until she acquires the Varia Suit that she can safely venture through the super-heated area, and it is not until she acquires the Gravity Suit that she can she venture underneath the magma. Norfair is also where Samus gets notable upgrades to her Power Suit, such as the Wave Beam and Screw Attack. In Super Metroid's Norfair, there is a room which features magma rising continuously, and Samus must get to the other side of the room, climb up platforms, and enter another room before the magma kills her. 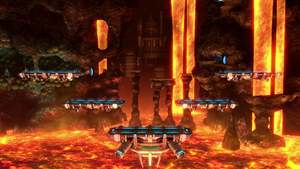 In this stage, the concept is retained by the safe room with Blue Doors, which appears for fighters to take refuge from the magma. The Blue Doors themselves are also based on how they appear in Metroid and Super Metroid, and they can also be seen in the background. The deepest portion of Norfair is where Ridley, leader of the Space Pirates, resides in his lair, and is also where Samus ultimately kills him in Super Metroid. In the background of this stage, a large brick structure that bears resemblance to Ridley's lair in Super Metroid and Zero Mission can be seen. A pair of column-like Chozo statues can be seen far in the background of the Norfair stage, which originate from Crateria in Zero Mission. After Samus acquires the Power Grip upgrade, one of these statues rises from the floor, providing platforms that Samus can use to exit Crateria's Chozo Ruins. A small area in Norfair from Super Metroid. A column-like Chozo statue in Zero Mission. Currently, Norfair is considered nearly universally banned in tournament play. Proponents of banning the stage claim that the increased number of edges promotes stalling the game by constantly alternating between edges for invincibility, and that the magma plumes provide an unnecessary degree of unpredictability. Those who believe the stage should be a counterpick insist that ledge-stalling is not that effective, and that the uniqueness of the stage is not brought down by the hazards, which can be defended against fairly easily. Regardless, the stage can assist characters who are easily gimped, since they are given more opportunities to grab an edge (especially tethers). In later Brawl tournaments, the stage has been banned much more frequently. It is also jokingly referred to as No(r)fair, regarding its legality. In Smash 4, Norfair has seen no use at all in tournaments for the aforementioned reasons, with every major since Smash 4's inception banning the stage. Norfair in Super Smash Bros. for Wii U. Added 8-player mode version of the stage (already had an 8-player Ω form). 8-player Norfair removes all magma-related hazards. Due to the nature of the hazards, it is possible for only one of the platforms to be safe to stand on, with the other four being covered by a combination of high magma tide and the magma fall from the left or right. A new platform is created in the background for the Pokémon Trainer to move around on if he is selected; however, the magma wave will appear in front of him. If the player uses Zelda/Sheik's Transform move just before they touch the magma at the bottom when the stage lowers, it is possible to either take a few hits from the magma until they rise again from it, or get KO'd. With proper timing, it is possible to avoid damage from the large magma wave by sidestepping and by using Marth's and Ike's Counter or Lucario's Double Team. Kirby and other characters with multiple mid-air jumps can float off the top of the screen just before the magma hits and take no damage. However, with this method, the player must beware of KO boundaries. Kirby can also avoid it using Stone. Pokémon Trainer can switch his Pokémon and Wario can Wario Waft and take no damage. This is the only stage in Brawl in which the music track of the same name as the stage has to be unlocked. The Facebook page posted when releasing the update, "Good luck fitting everyone into the safe zone on Norfair." despite the fact that no stage hazards appear on Norfair during an 8-Player Smash. ↑ Norfair. Smash Bros. DOJO!!. smashbros.com (2007-11-09). Retrieved on 2007-11-09. This page was last edited on April 16, 2019, at 15:22.